and a good gin Martini. As the day wore one - and I had consumed my Turkey sausages, I called my family back in Toronto. 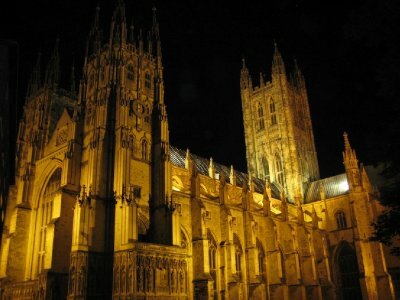 I spoke to the family back in Toronto as the clock turned over to 11 PM here in the UK. They were sitting down for Turkey, stuffing, mashed potatoes and all the trimmings. I hung up the phone, knowing they would soon be on to pumpkin pie. So to you all reading this, regardless of the day or your nationality, I wish you a Happy Thanksgiving. Early October may be the Thanksgiving day for Canada, but we should be aware of what we need to give thanks for every day. Look up, this is the world you live in. It may be harsh and hard at times, but it can also be beautiful. It gives so many gifts, even when at the time they seem like blows to your chest. Hard lives are hard won. Thankful for everything that has happened - the good, the bad and the ugly. If it hadn't of happened, I'd be a different man, in a different place, in a different set of circumstances. Maybe it would have been better, maybe it would have been worse. But it wouldn't have been me. 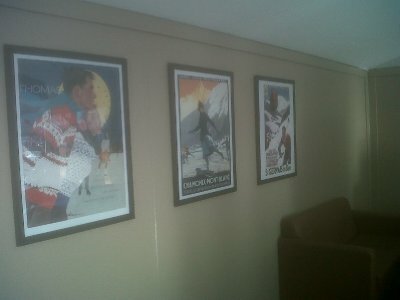 I used to travel quite a bit (as this blog attests). 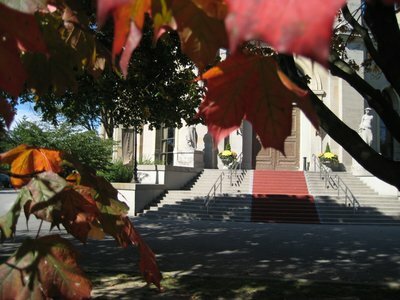 From 2001 until 2008 I spent a significant portion of my time on the road, away from my Toronto home. As an example, in 2006, I spent 215 days of 365 possible (58.9%) of my time outside of Canada. Mostly that was for work, but I would often during that time be planning leisure trips. In 2002, I spent a good six months planning for my 2 months sabbatical in South America. Reading travel books, figuring out visas, planning routes, getting shots, researching and booking transport and hotels. After that, and up until I moved to the UK, I seemed to constantly be planning a new, upcoming trip. Whether it be to Costa Rica, Tanzania or Japan. One of the biggest logistical challenges I faced was when I was planning for the Paris to Hong Kong trip in 2005. I was working at the time on a project that saw me jetting between Montreal, San Francisco and Paris. Obviously I needed my passport to perform all that travel. At the same time, I was trying to get visas arranged for Belarus, Russia, China and Mongolia. All of them required my passport as well. 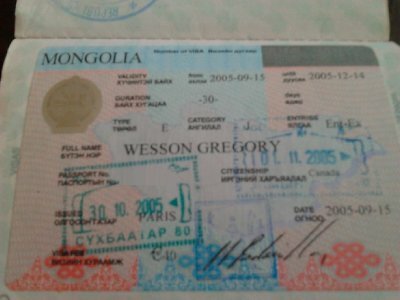 In a feat of logistical planning brilliance (and paying for some expedited service), I managed to get all the visas and still be able to meet all my work travel requirements - arranging to pick up the Chinese visa when I was in San Francisco, arranging the Belarus and Mongolian visas from their Parisian embassies, and Russian visa in Toronto (as the Russians said I needed to get it from my home country in closest to where I lived). During that time, more and more I would think to myself that the travel was so temporary. Even when I was staying in a place for months on end, there was always that apartment back in Toronto that I knew I would eventually return to. It started to dawn on me that what I was really yearning for was an opportunity to immerse myself in a place, to cut the ties to Toronto and take the brave, bold step of living abroad. I was envious of those who lived abroad. They got to immerse themselves in a culture. It was like constantly travelling. Even as far back as 2005, while I was running around trying to arrange those visas, was I already thinking of that next step. I think it would be fun to live in a foreign country. As I travel from place to place to place, I am always on the lookout for places that I think I could live in. Maybe some day I'll actually pull the trigger and move some place for a year or two, but for now, it's just dreaming. A year or two? Naive young man. 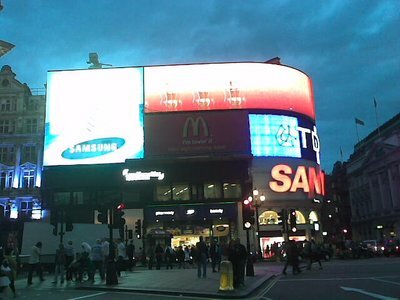 4 years on in London, and no thoughts of heading back to Toronto yet. So my wanderlust and constant travel planning has disappeared, replaced by the getting on with life in a new land. The past few days here in London, I have been arranging dental appointments, arranging for a pick up of a parcel and shuffling around some investments in my various pensions (have managed to pick up 4 different pension accounts in my 4 years in the UK). I have no thoughts of upcoming trips in my head, save for a quick day-trip to Munich for work at the end of October, and vague thoughts about needing to plan a winter ski trip. Yesterday, I came in the office early, and found a co-worker standing at the photocopier, looking perplexed. "You're in early," I said. "Oh, yeah," he replied, punching at the buttons on the machine. "I have been arranging visa appointments. I am dropping off my passport to the Russian embassy today, and just got off the phone booking an appointment for my US visa. It's not until the end of the month. I could have squeezed it in the week after next, but I'll probably only get my passport back from the Russian embassy on the Monday, maybe Tuesday, and I need to fly to Malaysia on the Thursday. Didn't want to take the chance that I wouldn't have the passport, or that the Americans still had it while I needed to be boarding a plane to Malaysia." I laughed. "Reminds me of the time I was arranging for my Paris to Hong Kong trip," I said, and told the story of my logistical triumph above. After I ended my story, my coworker cursed. "Can't get this scanner to work. It won't let me enter an email address to send," he said. "Strange," I replied. "It was working yesterday, because I scanned my pension document and mailed it to myself." "Technology," he said, shrugging, and walked off down the hall to use one of the other photocopiers in the building. I walked off to my desk. Moscow, Kuala Lumpur, New York. These are the places that my coworker is going. Getting flights, booking hotels, arranging visas. All the things I used to do. What have I done this week? Pension, dentist, deliveries! Right at that moment, I missed it. That adventure and excitement. I wanted to be planning a trip somewhere. Flying off to exotic lands. I wasn't. I wasn't going anywhere. The feeling faded as the day wore on. A short burst of travel envy, that passed as I thought about my life and where I am now. Living abroad, the "constant travel" that I was envious of back when I was travelling. It sure looks like fun, but it can be awfully tiring. And I know if I was doing it now, I'd probably be looking at those who had moved there with a touch of envy. The grass is always greener, isn't it. Even if you have lived on that lawn before. 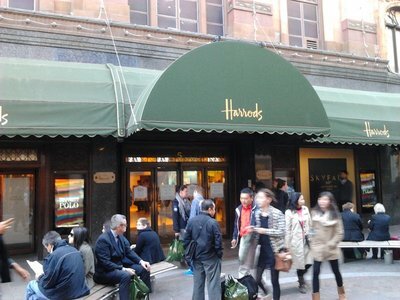 Last Christmas, I was given a very generous gift of a gift card to Harrods. Harrods is a high end department store in West London. The store has one million square feet of retail space, making it the largest retail space in Europe. The size of the store and scope of products on offer brings thousands of tourists through the door each day. 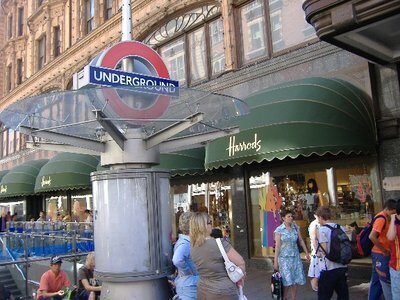 Harrods has a Latin motto - Omnia Omnibus Ubique, meaning "All Things for All People, Everywhere." Many products are priced well above the price brand for "all people," but there is the food hall to find a decent priced item. I spent the day walking the halls of the store trying to find items on which to spend my gift card. I must admit, mostly I just did double takes at the prices. £145 for a bottle opener? Luckily there were a few items I picked up - a pair of Ray Ban sunglasses and a calendar. Though I still do have lots on my gift card to go through. I did find one way to burn through the card value, though. At the Caviar House Oyster Bar in the Fish Hall in the Food Halls. I started out with a glass of Harrods Lager and a plate of Scottish smoked salmon. 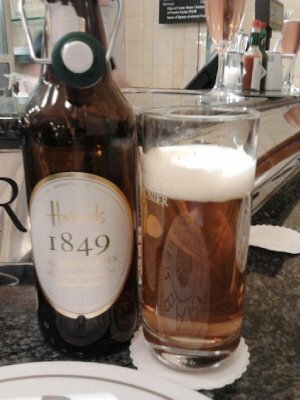 The lager is a German beer brewed by Hofmark Brauerei. The beer wasn't great, a bit thick and sweet, but actually worked out okay as an offset for the oil in the salmon and salty taste of the oysters. 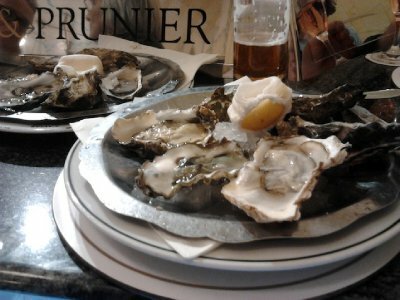 Oysters were up next, a selection of rock oysters. Decent tasting, salty and sliding down easily. 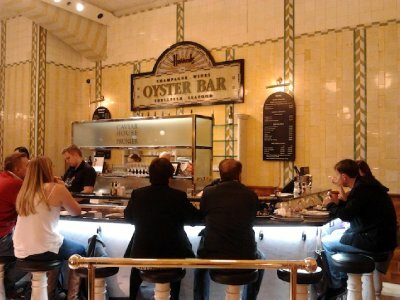 It made me recall my experience in the oyster bar in the basement of Grand Central Terminal in New York City. 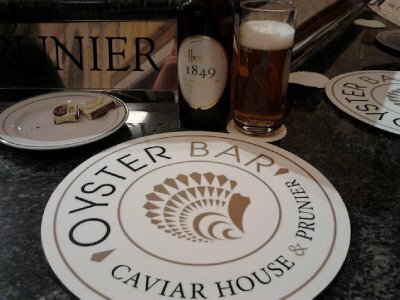 I got the bill - £66 for 2 beers, a salmon appetiser and 12 oysters. Decent food, and while I probably wouldn't have paid the prices of my own accord, certainly a decent way to burn through some of the money on my gift card. The SAS on Park Lane. I was walking up Park Lane today, heading to get a Martini at the Grosvenor House Hotel, an attempt to try and shake off the emotion of Harrod's when the Scotsman stopped me. Now, I should probably explain what the "emotion of Harrod's" is to you. Harrod's, in case you don't know, is one of the high end shopping department stores in London. So much so, that it has become a tourist attraction. Especially moreso since the owner's son, Dodi was killed in a car accident in Paris along with one Diana Spencer, oft known as the Princess of Wales, the first wife of Prince Charles, heir to the British and Commonwealth throne. So you face in Harrod's a mix of the hoi polloi gawking at the Diana and Dodi memorial, food hall and outrageously priced merchandise, and the uber-rich trying to buy said merchandise. I, sadly, sat somewhere between the two - not rich enough to think that £156 was a decent price for a bottle opener, but also not there to gawk and instead to spend some money (I shall expand on that in a future entry). After all that, I needed a drink. Feeling a bit posh after laying down a few quid on Ray Ban sunglasses (a bit of a guilty pleasure of this otherwise Protestant tight-wad), I decided a nice Martini would hit the spot. 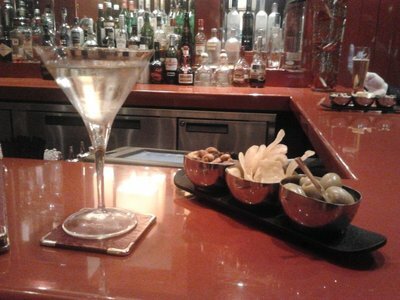 As the Martini is an American invention (H. L. Mencken called the Martini "the only American invention as perfect as the sonnet"), I decided to head to an American hotel and have my drink at the Redbar at the Grosvenor House Hotel by Marriott on Park Lane. So I found myself walking up Park Lane - one of the poshest streets for tourists in London - with a Harrod's bag in my hand (containing my Ray Bans and a 2013 wall calendar (price £15)). That's when the Scotsman approached me. "Excuse me," he said. "What's the best way to Victoria?" He didn't look a vagabond, cleanly shaven and carrying a small duffel bag, looking every part the out-of-town tourist you might expect in this area. I looked over his shoulder, and watched a 73 bus pulling away from a bus stop just 40 feet up the street. Emblazoned on the front was the destination - Victoria. I pointed over his shoulder. "Well, it's a long walk from here, but if you catch that bus it'll..." I offered, but he cut me off. "Where you from, America?" He asked. "No, Canadian," I replied. "So, you can catch that...". Again, before I could finish my sentence, he interrupted me. "Canadian. Even better. Let me shake your hand." He said. I shook his hand. He didn't let go for the next 4 minutes. "Let me ask you a question," he said. "Do you know any Scotsmen? Do you trust Scotsmen?" How is one supposed to answer that? In reality, with afterthought to compose any answer, my answer should have been, "I don't make judgements on how much to trust someone based on their nationality, but instead make my judgements based on their attitude and actions." However, easier said retroactively in a blog than at the time. Instead, in the heat of the moment, I said, "Um, yeah. I know some Scots." "So you trust Scotsmen then?" He pressed. He introduced himself. "Staff Sargent Harold Potter, first wizard corpse of the Queen's battalion," he said. Or something like that. The Scotsman went on to explain he was SAS, having just arrived back at RAF Northolt this morning at 6 AM after a tour of duty in Afghanistan. "I can't call any one to help me get home," he said. That comment went unexplained, but in my head I decided to believe it was because as a member of the SAS, your missions are so secret that even your friends and family can't be alerted to when you arrive back in the country. After the story, he turned away. "This is so embarrassing," he said, tears welling up in his eyes. I knew where he was heading. I have been hit up by this before. But Staff Sargent Potter's request was a surprise. "I need 87 quid to get the East Coast line back home." "Sorry to hear that mate," I said. "I don't have 87 quid, but can help you out with something." I dug into my pocket, looking to see what loose change I had. I pulled out 3 one-pound coins. Stf-Sgt Potter shook his head. "No, please, don't insult me with change." he said, looking away. "Okay," I said. "Sorry I couldn't help. Have a good day.". I tried to pull away, but he was still shaking my hand and pulled me back into his orbit. "I can't take the change, but could you buy me the train ticket?" he asked. "Umm, sorry, no." I replied. Already, there was too much about Potter's story that wasn't ringing true. He was trying to get an East Coast train to Scotland, but was heading to Victoria station (instead of King's Cross or Euston where trains to Scotland leave from). The whole, "I am SAS and thus can't call friends or family to help me," just seemed unbelievable. And the fact that the forces would just turn out someone on the street after landing less than 15 hours ago seemed unreasonably cruel, even for a Tory-led British government. "Please, buy me the ticket to Scotland," Stf-Sgt Potter asked. "No, sorry, I don't have that kind of money," I said. I started to walk away, finally pulling myself free from Stf-Sgt Potter's grip. "Wait, wait..." He called after me. "Okay, I'll take the change." I handed Stf-Sgt Potter the change. He took it without a thank you, and walked 10 feet down the street before he cornered someone else. I could hear the refrain "SAS just arrived at Northolt" as I walked up Park Lane. I, Harrod's bag in hand, headed into the Redbar at the Grosvenor House Hotel, and paid £13 a Martini to drown away my troubles. Night fall covers me, but you know the plans I'm making. Still overseas, could it be the whole world opening wide? It has been a busy few weekends past. 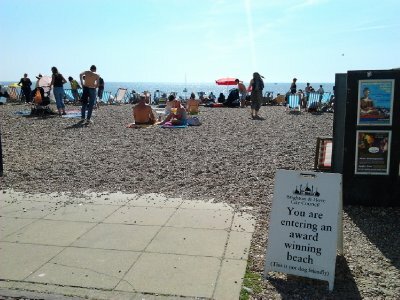 First was my trip to the Paralympics, and then, with a friend from Canada in town, two weekends of day trips to Hampton Court Palace, Brighton, Canterbury and... um, this is a little embarrassing... 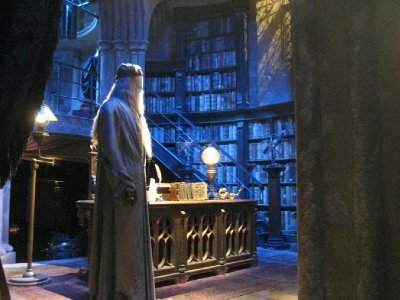 The Harry Potter Studio tour. Actually, Harry Potter was surprisingly good, even though I haven’t read any of the books and only seen the first of the films. Given all this activity, I decided to take it easy this weekend. I slept in, did some laundry and as a final activity got my haircut. I planned to grab some take-out chicken from Nando’s and head home for a Saturday night in. My haircut finished up about 16:30, so a little early for dinner. Instead, I popped into a local pub to catch the end of the Saturday Premier League football. I had a couple of pints, watched the football scores come in and surfed the internet on my phone. It’s not the first time I have caught myself thinking like that. Thinking that this is just a temporary situation - a holiday away or a longer-term business trip. I still, after four years living here, sometimes find myself surprised at the fact that I really am living abroad. The truth is, I don’t really feel like I am British. Certainly, legally I am not - not at least for another couple of years. However, at some point I would have thought I would start to feel like I belong here. This isn’t an externally driven feeling. The people of London who I know have never made me feel like I wasn’t welcome. I feel accepted here. I feel like I have a life here. I feel like people are happy to have me here. But I don’t feel natural here. 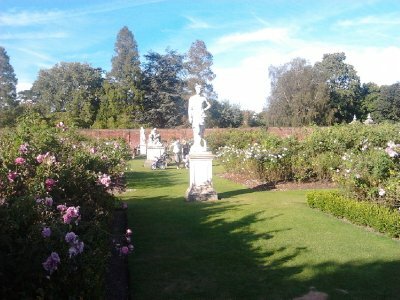 I don’t feel far outside, but I do feel like an outsider, just always outside of the circle of those who have lived in the UK all their lives. I wonder if that ever goes away?